It's finally Friday! I'm always so excited to get to the weekend, because it means sleeping in, having coffee in bed and spending time with my boyfriend. This week we've been playing Mario Odyssey on Switch, which we got last weekend and have been so excited about. I'm hoping we can play quite a bit this weekend as well as I believe the weather won't be that amazing before next week. I've loved the co-op campaign on the Mario Odyssey because it's done really well in my opinion. It's challenging at times but so playable that you don't get frustrated with it. We have set a goal to play it 100% through and I definitely believe we can achieve that goal. 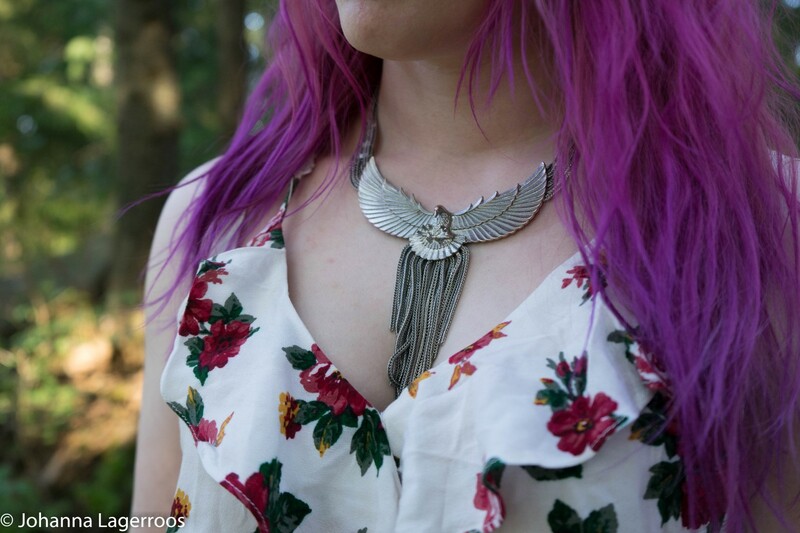 As for today's post, I really wanted to share another outfit with you. This one is something I wore for a lunch with my boyfriend, my grandmother and her sister. I like how there's both girly and edgy elements here, and I can definitely say Elize Ryd's style was a bit of an inspiration for this look. 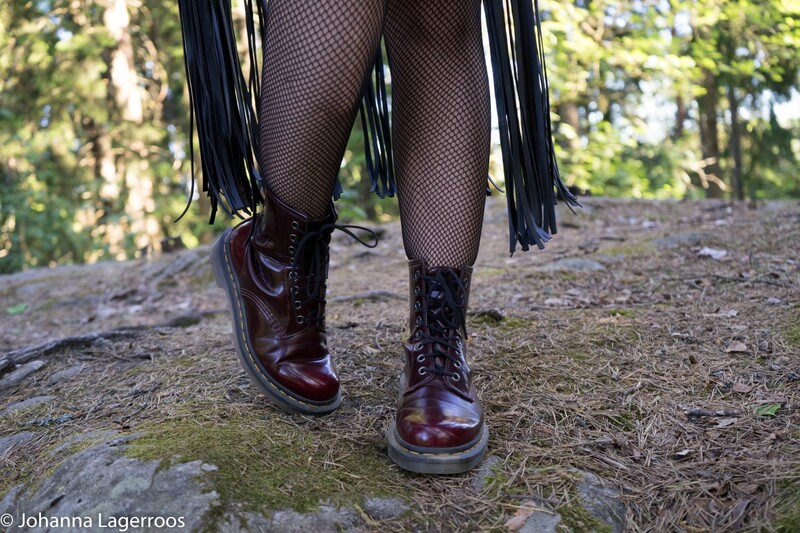 Except she probably would wear chic knee high boots with this look, whereas I opted for my vegan Dr. Martens. This playsuit is from Shop Sweet Mayhem, they are a small business located in California, and run by a fellow blogger Cindy Do. I've been eyeing their Instagram for a while now, and finally decided to order something from them since I got into their collaboration program. I figured I would test drive the company out before promoting them to you, and so far I've been very happy with them. The clothes look like they do on the site, and they arrived relatively quickly here to Finland. I had one item missing from my order, but the refund was arranged very quickly after I contacted them about it. The items I did get were all very fine, and the quality seems on point after few uses. I also have a discount code for you in case you would like to try out their clothes. With the code SILVERTIGO you get 20% off your purchase at the checkout. I do get little perks for promoting their items so in case you don't want to use my code, that's fine. They do have quite nice sales as it is. One thing to note is that they run out of stock quite fast since they are more like a boutique. Also, they have quite accurate sizing chart on the website, and I'd say that the items run a tiny bit smaller than usual (in Europe, at least). I ordered my items in size medium although I'm usually size small. I figured it's better to be safe than sorry, and I could always fix them smaller in case they were too loose. Which they weren't, medium seems like a good fit for me. I'm around 5'1" and somewhere around 52 kg in case it's any reference to you. The belt with fringe you see in this outfit is from Etsy, and as well as the peplum harness in the previous outfit post, I will go little more into detail with that one in a future post. 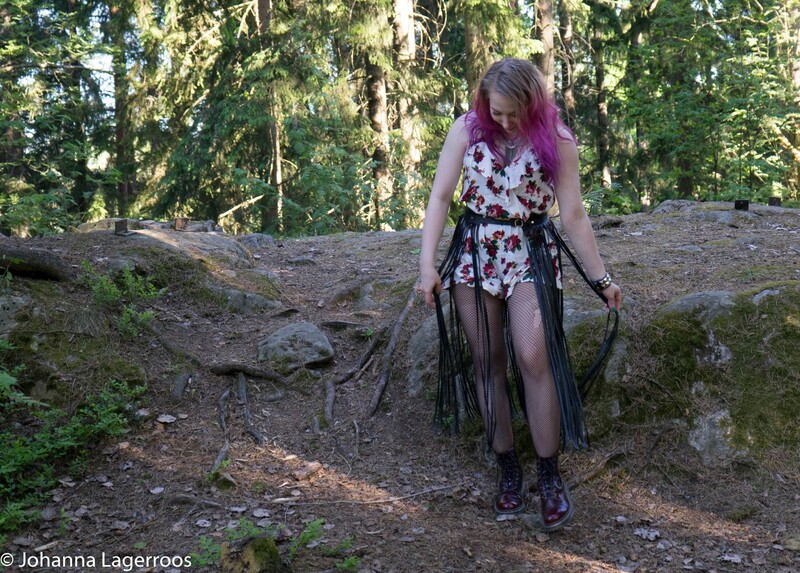 This outfit was something I really loved wearing, and would absolutely wear it to a rock concert or a festival. I liked how it looked on me, and it has the kind of vibes I would love to have more with my style. Which is metal-inspired and rock chic, while still being a little girly. I've hunted some items to fit this kind of style better and at the same time thrown out stuff that is not giving the same vibes. I feel like during the past year, I've finally figured out my adult style and also have the confidence to wear it. I've also grown over following trends all the time and instead having a more timeless style. Which reminds me that I need to share my summer edition of the capsule wardrobe with you all soon. I try to get it shot during the weekend and out next week if nothing major comes up. That's all for this Friday, I hope you will all have an amazing weekend and that you have some fun plans. I will probably have one more post up this week but in case not, I will see you all next week. In the meantime you can also follow me on Instagram, where I post daily outfits and more. You can find me as @silvertigo! It's such a pretty playsuit. Love the floral print.